Payday loans, also known as a payday advance, are small short-term loans to help borrowers with expenses until their next payday. Typically, working class people with little or no assets are the prime target for payday loans because this group is unlikely to obtain a low-interest form of credit. Because payday lenders charge higher interest rates and do not encourage savings, they deplete the assets of lower-income communities and should be used carefully. Legislation for payday loans tends to vary between different states. Some have strict usury limits, which limit the nominal annual percentage rate (APR) that the lender can charge. Some states outlaw payday loan practices completely, and others have few limitations on payday loans or their lenders. Check with your state and know the laws before you proceed. Payday loans are primarily regulated by the state, but the United States Congress passed a law effective October 1, 2007 that capped the lending to military personnel, maxing out at 36 percent APR. Some bank regulators and legislators would like to restrict or prohibit payday loans for all borrowers because they cause a financial drain on working class citizens due to the high costs of these loans. The APR on a $15 charge for a $100. (2 week loan) is 26 × 15% = 390%. The EAR on this same charge and amount is (1.1526 − 1) × 100% = 3,685%. Some payday loan lenders use illegal aggressive collection practices, such as threatening the delinquent borrower with check fraud. This type of practice is illegal in several jurisdictions and prosecuted criminally. Payday lenders are allowed to use the standard collection practices used by the credit industry to collect on a debt. Educate yourself on payday lenders and their fees. By understanding the laws associated with cash advances and payday loans, you will ensure that you are paying the appropriate fees and nothing more. Know what your rights are as a consumer. You should also read the fine print. All payday lenders must disclose the fees they charge upfront in bold typeface on the contract, and this contract must be written in a clear concise language for you to understand. Lastly, you should shop around. 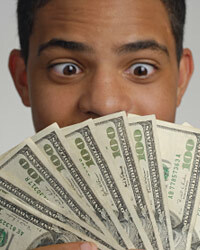 There are many lenders to choose from and you should compare fees and costs when making a selection. Choose the lender that works best for you.